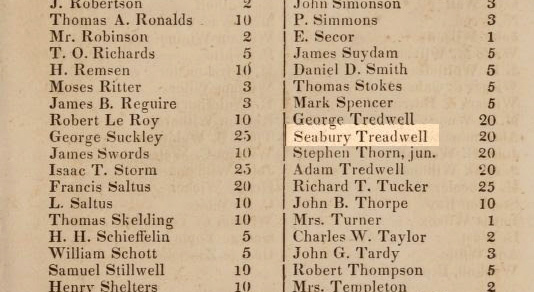 Between 1821 and 1840, Seabury Tredwell’s wife, Eliza, gave birth to eight children. 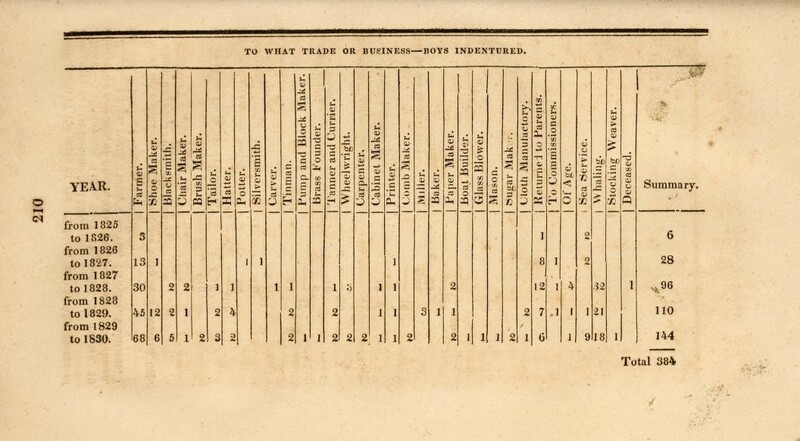 Considering the primitive medical care available in the antebellum period, and the resulting high rate of infant and childhood mortality, it is remarkable all of the Tredwell children lived to adulthood. Gratitude for their good fortune in light of the risks associated with childbirth may have been the impetus behind the Tredwells’ decision to support the New York Asylum for Lying-In Women (NYALIW). By the turn of the 19th century, many women found themselves struggling alone to support themselves and their children. Two major yellow fever epidemics, in 1795 and 1798, left many of them widowed. 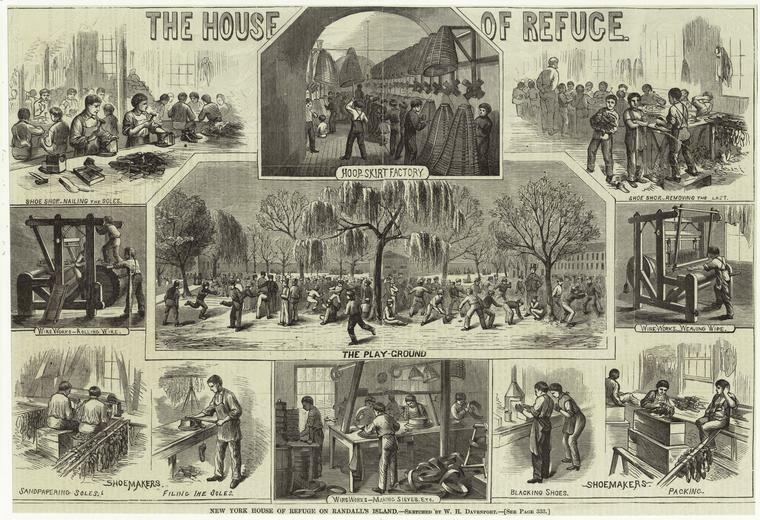 The influx of immigrants to New York City led to a population boom, but jobs were scarce for this group. 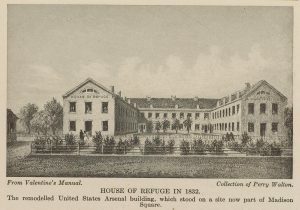 Alms House Hospital, Bellevue, 1852. 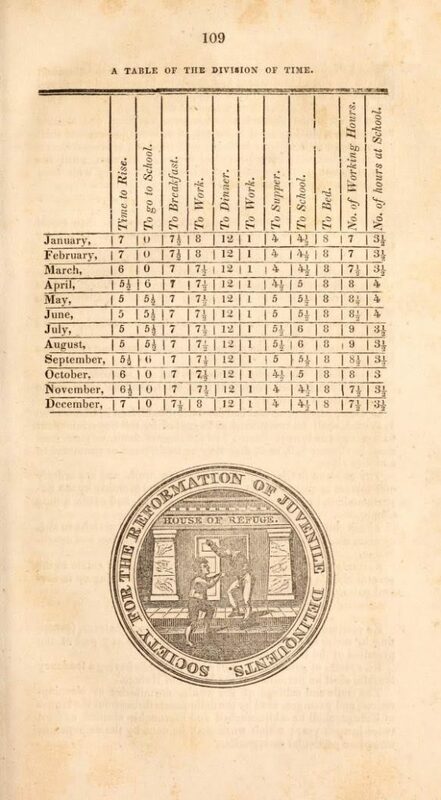 (digitalcollections.nypl.org). Husbands frequently needed to travel far from the city in search of employment. Some never returned. The incidence of alcoholism among the poor increased. As a result, many pregnant women lacked traditional family support, especially when assistance was needed as the time of their confinement approached. 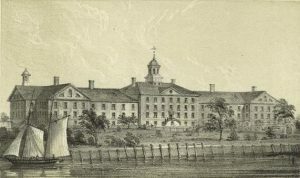 It is ironic that, although America began to take on a sentimental attitude toward motherhood in the late 18th century, moralistic and religious convictions found many pregnant women, especially unwed ones, with no other recourse for medical care except the almshouse at Bellevue Hospital. “Respectable” women sought to avoid this institution, however, as it had a reputation for being a haven for prostitutes and other “degraded” women. In the early 1820s, wealthy women began to focus their reform efforts on women’s causes, such as education and improved health care. 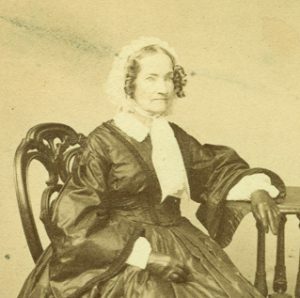 In 1823, a group of benevolent women led by Mrs. Arthur Tappan, wife of the abolitionist Arthur Tappan, established the New York Asylum for Lying-In Women. Its aim was to provide temporary accommodations and skilled medical assistance to poor but “reputable” women during their confinement. “Reputable” in this case meant married; in fact, all applicants were screened by a committee, and were required to furnish a marriage certificate and character references to be considered for admission. “The quality of mercy is not strain’d. 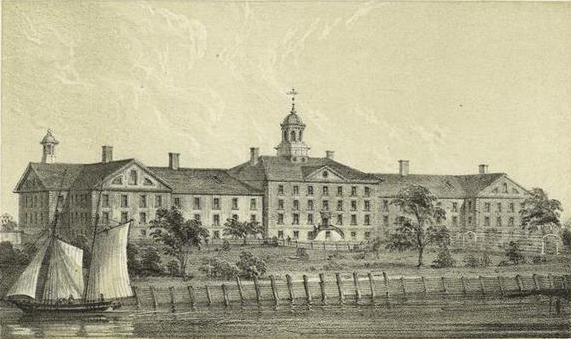 New York Hospital, 1791. (digitalcollections.nypl.org). Although it employed a resident male physician, the NYALIW was unique in that it was managed and run by women: it had an all-female board, and barred male medical students from entering the institution. Births were attended by either a midwife or the matron. Postpartum care and vaccination of all newborns against smallpox were provided before discharge. 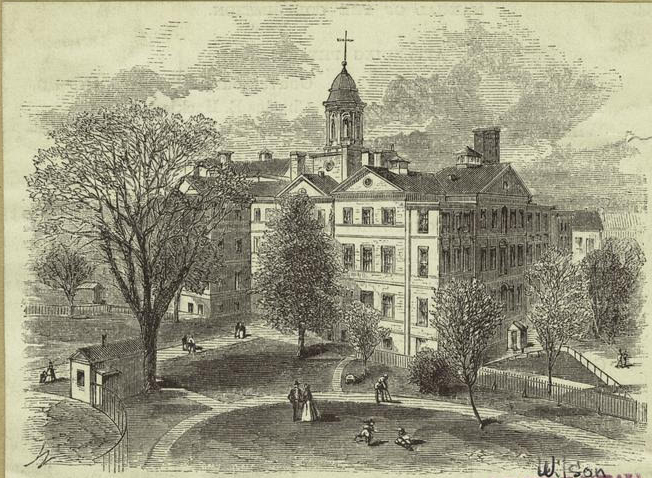 The charity’s first home was the Square Ward of New York Hospital, then located on Broadway between Anthony Street (now Duane Street) and Catherine Street (now Worth Street), which opened for admissions on November 1, 1823. The first patient was Catherine Martin, the wife of a weaver, John G. Martin, who had left his wife three months previous to look for work. Mrs. Martin was admitted on the 21st of November, and gave birth to a healthy child. 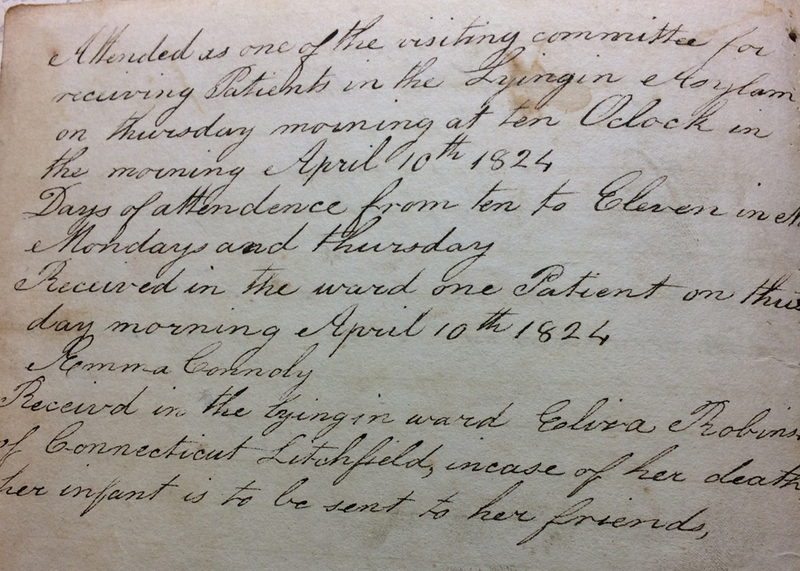 She was discharged on January 1, 1824. 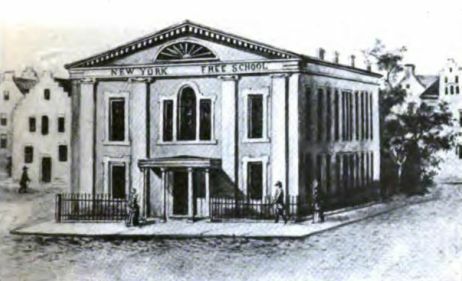 Within a few years the NYALIW outgrew its ward at New York Hospital, and sought donations for the purchase of larger quarters. 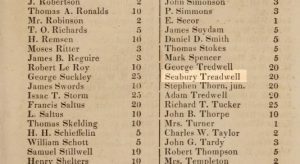 In 1825, Seabury Tredwell was among the first group of donors, giving $24; the amount collected enabled the charity to move to larger facilities on Greene Street. In 1830, the charity had garnered sufficient funds to relocate to a three story building on 83 Marion Street (now Lafayette Street), where it remained until its move in 1885 to 139 Second Avenue, between 8th and 9th Streets, in the heart of the 14th Ward. Letter of Recommendation to NYALIW, 1834. (NYHS Manuscript Collection). 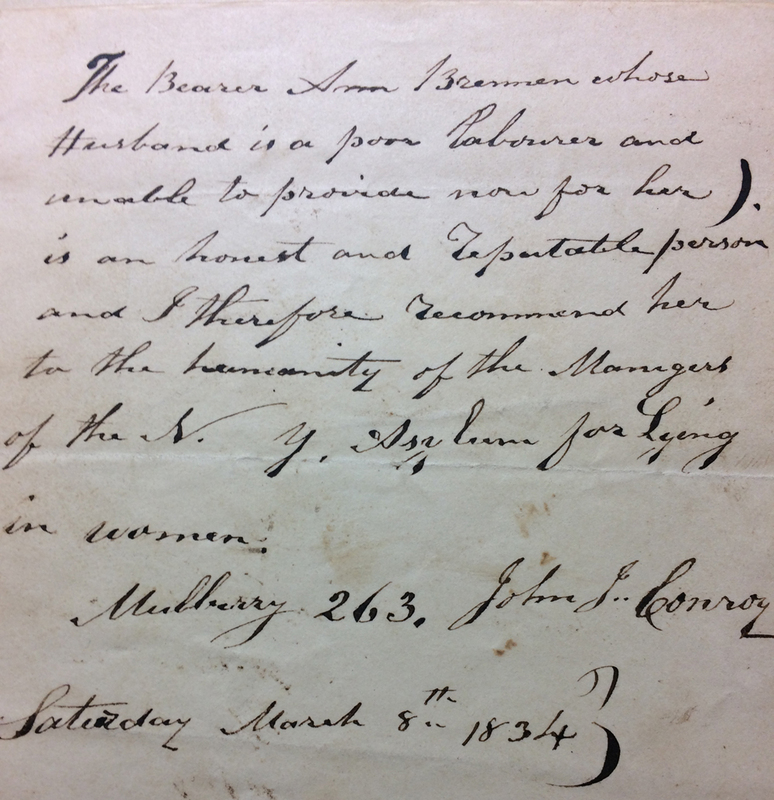 In 1832, Seabury once again donated to the NYALIW. His $25 subscription made him an “Honorable Member for Life,” along with other prominent citizens such as Joseph Brewster, Philip Hone, Duncan Phyfe, and Benjamin and George W. Strong. No doubt the Tredwells felt strongly about this cause, because from 1828 to 1861 Eliza Tredwell, an Annual Subscriber, donated $3-$5/year. “The bearer Ann Brennen whose husband is a poor laborer and unable to provide now for her is an honest and reputable person and I therefore recommend her to the humanity of the Managers of the N.Y. Asylum for Lying in women. One story in the NYALIW’s minutes, which is typical of the circumstances that befell many poor women, is that of Mrs. Anne Croaker, who applied for admission on September 13, 1828. Her husband, who had worked as a locksmith for seven years for a Mr. Pye, had recently died. His death was hastened by a dose of arsenic, which was sold in error by the druggist. Mrs. Croaker, left completely destitute, lived with her five young children in a room on Canal Street, which had been loaned by a friend. The Admissions Committee visited Mr. Pye, who vouched for Mrs. Croaker’s character; he stated that she was forced to “sell her most valuable things to procure comforts for him [Mr. Croaker] during his illness.” Mr. Pye generously offered to provide for the children during their mother’s confinement. 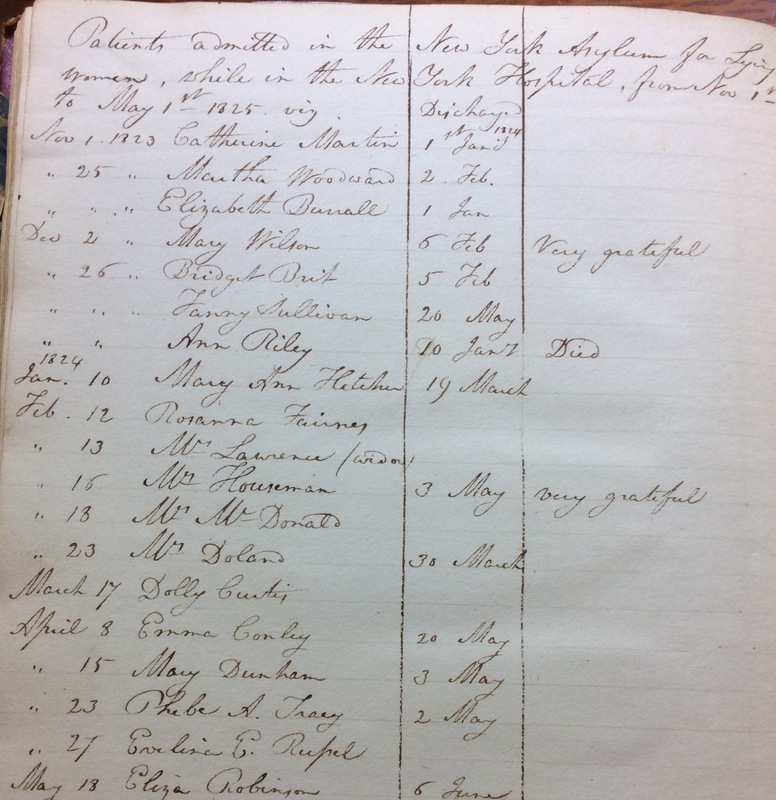 Page from Mrs. Collin Reed’s Ledger Book, 1824. (NYHS Manuscript Collection). In 1831, due to the insufficient numbers of married women who were seeking assistance at the doors of NYALIW, the institution broadened its admission requirements to include unmarried women. It also began making home visits to extend its outreach. For several years previous, however, some committee members had begun to overlook the questionable tales of woe and the dubious marriage certificates furnished by some applicants; thus a number of unmarried women were permitted to enter. Admissions Book, NYALIW, 1823-1825. (NYHS Manuscript Collection). Upon their discharge, the administration sought to place unmarried women as wet nurses in respectable families for one-year periods. After careful screening at the time of admission, observation throughout their confinement, and physical examination by a physician at the time of delivery, the charity was able to offer a guarantee of the health and character of the wet nurses hired by prospective upper class families. In 1828, NYALIW proudly announced that “Of fifty who have been discharged from the house…23 have obtained places as wet nurses in respectable families.” No mention was made of the fact, however, that these women most likely would have had to find a wet nurse for their own infants. At its 48th annual meeting, held on April 19, 1871, NYALIW reported that since opening its doors, it had gratuitously assisted 16,329 women. 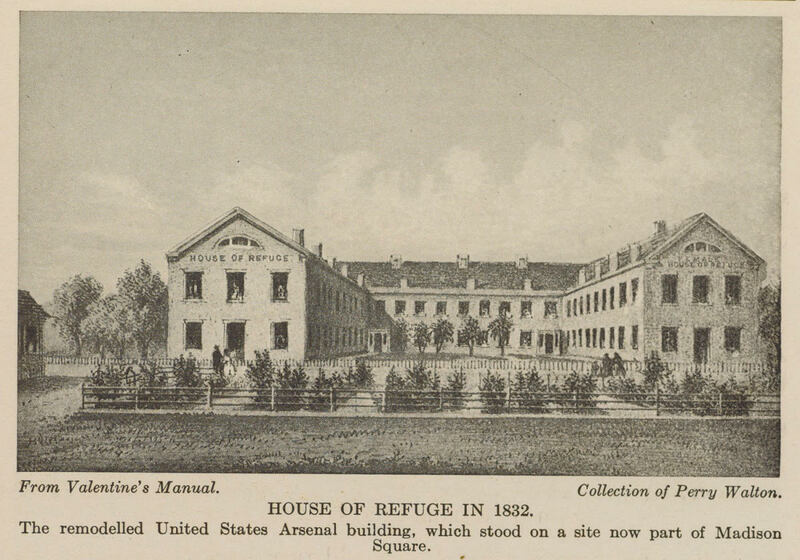 It noted that in 1870, 86 patients had been treated at the Asylum, and 188 more at their homes. 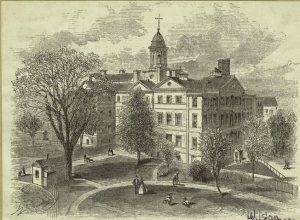 In 1894, NYASIW changed its name to the Old Marion Street Maternity Hospital; in 1899, it merged with the New York Infant Asylum. The charity ultimately became the Obstetrics and Gynecology Department of New York Hospital-Cornell Medical Center. Of flour, butter and sugar 3 pounds each, 2 doz eggs, 4 lb and a half of currents 6 lb of raisins, mace, cinnamon, nutmeg each ounce 1/4 oz of cloves, 2 tablespoon full of ginger 2 gills of wine, 1/2 pound of citron. Wishing you a joyous holiday season! Merry Christmas! “Anniversary of the New-York Asylum for Lying-In Women.” New York Times. April 20th, 1871, p. 2. timesmachine.nytimes.com. Accessed 12/6/16. Golden, Janet. A Social History of Wet Nursing in America: From Breast to Bottle. Cambridge, U.K.: Cambridge University Press, 1996. Managers of the New York Asylum for Lying-In Women. Annual Reports, 1824-1855. www.archive.org Accessed 11/15/16. Minutes, 1823 Nov. 1-1831 Feb. 28. 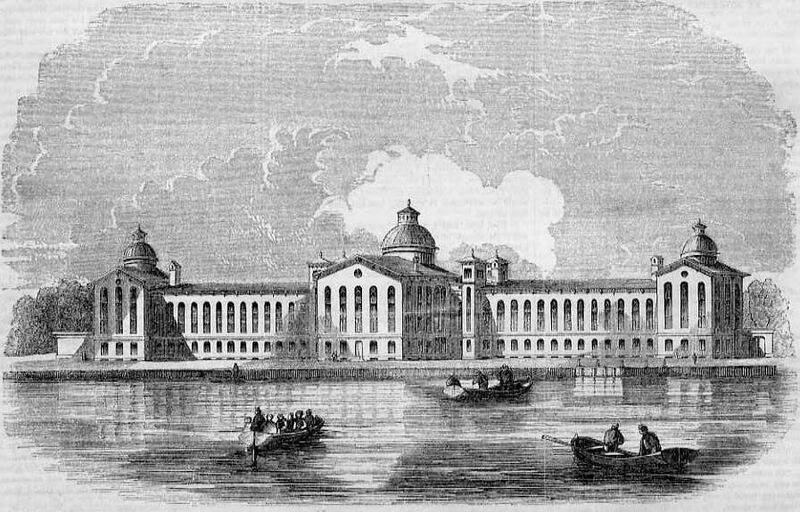 New York Asylum for Lying In Women. BV 89584. New York Historical Society Manuscript Collection. New York Asylum for Lying-In Women Materials. Delaplaine Family Papers. 89638. Box 4, Folder 9. New York Historical Society Manuscript Collection. Quiroga, Virginia A. Metaxas. Poor Mothers and Babies: A Social History of Childbirth and Child Care in Nineteenth Century New York City. New York: Garland Publishing, Inc., 1989. Shakespeare, William. The Merchant of Venice, Act IV, Scene 1.